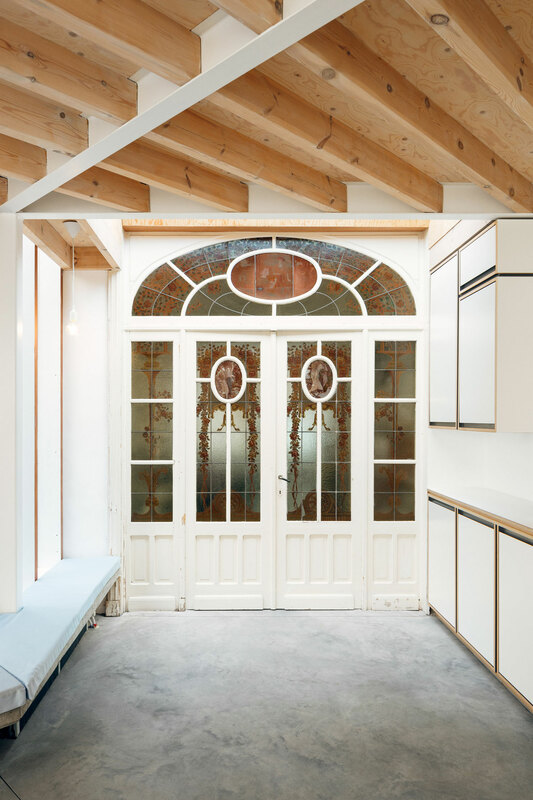 Alteration & Addition to a Heritage House in Belgium by i.s.m.architecten. 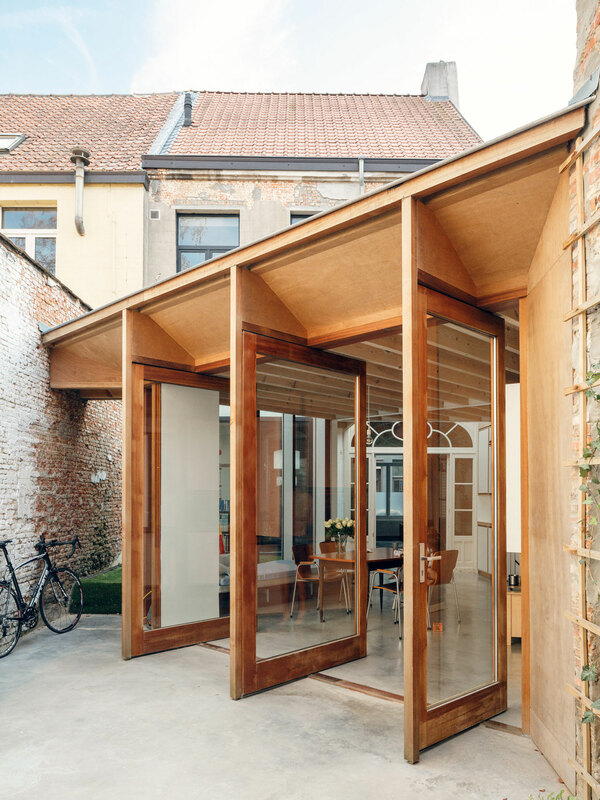 i.s.m.architecten have transformed a row house in Sint-Niklaas, Belgium into a wonderful, light-filled family home. The existing house was renovated, refreshed and brought back to its former glory then cleverly woven into a new ground floor addition that contains the kitchen and living spaces. 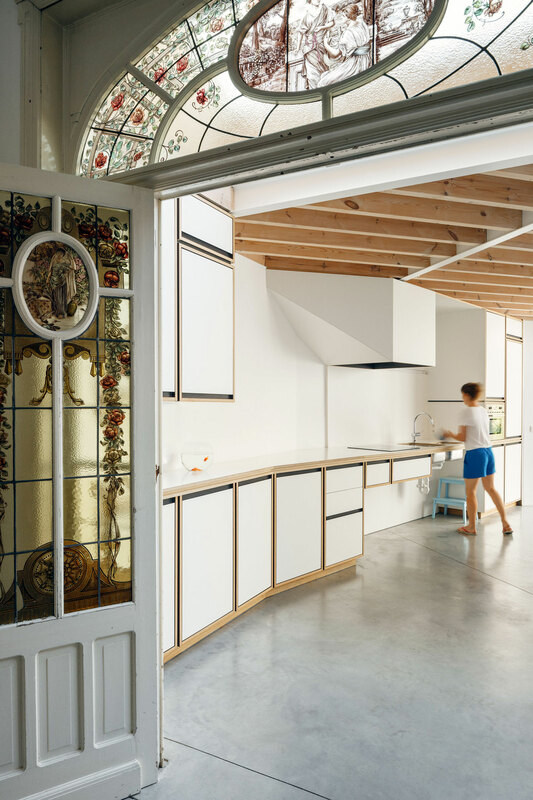 A skilful example of old meets new; the transition between the two forms takes place beyond the threshold of ornate double doors and is heralded by an impressive skylight above. A new, crisp character is expressed in the extension which celebrates strong clean lines, angles and an unadorned material palette of wood, steel and concrete. Materials are both aesthetically pleasing and practical in their application. 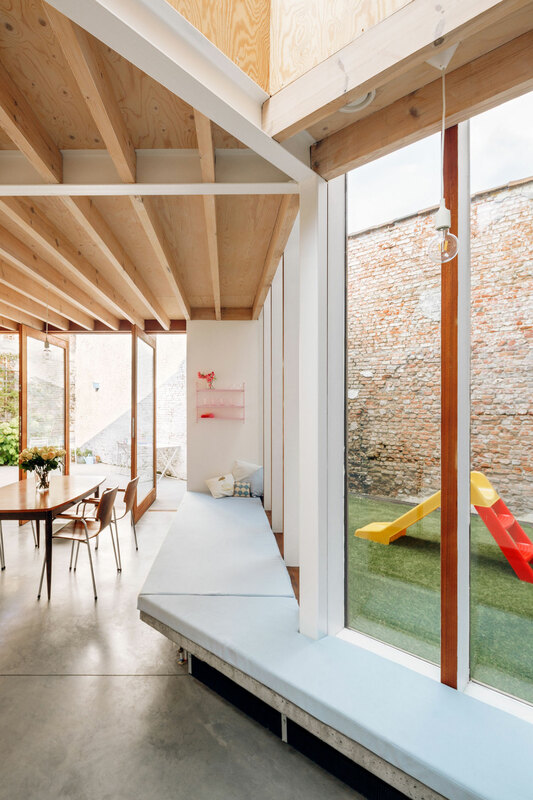 A concrete bench runs the length of the extension concealing the heating equipment and doubles as a window seat to view the patio. Wooden windows along this concrete bench have been painted white on the side lending a nice graphic touch that unifies the interior. 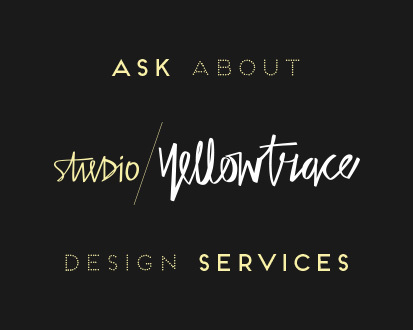 Light and spatiality are the two key elements explored in this project. These elements are nicely captured by the angled shape of the extension and the introduction of a patio and skylight. By playing with the direction of the building, a more spacious floor plan is created. The plan seamlessly extends past the three pivoting doors that when open, provide continuity between the interior and exterior spaces. 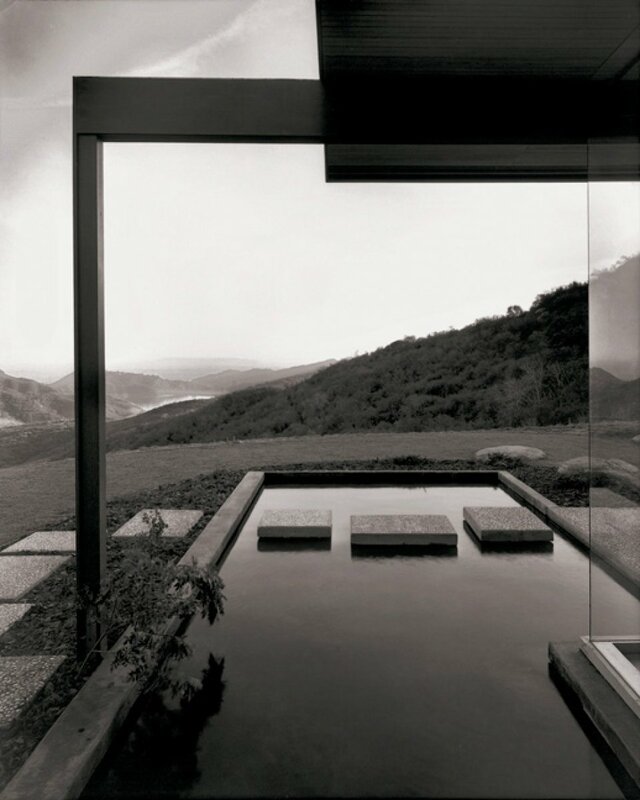 This connection is further strengthened with the use of polished concrete floors which run from inside to outside. 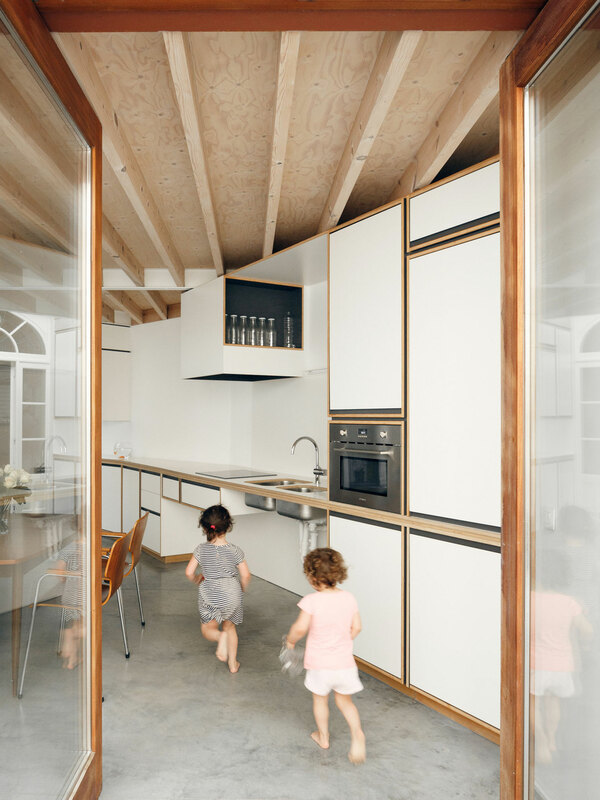 Related Post: LVDV Apartment by i.s.m.architecten in Leuven, Belgium. There is some lovely detailing and customisation in this project, yet it was a rather cost effective exercise. 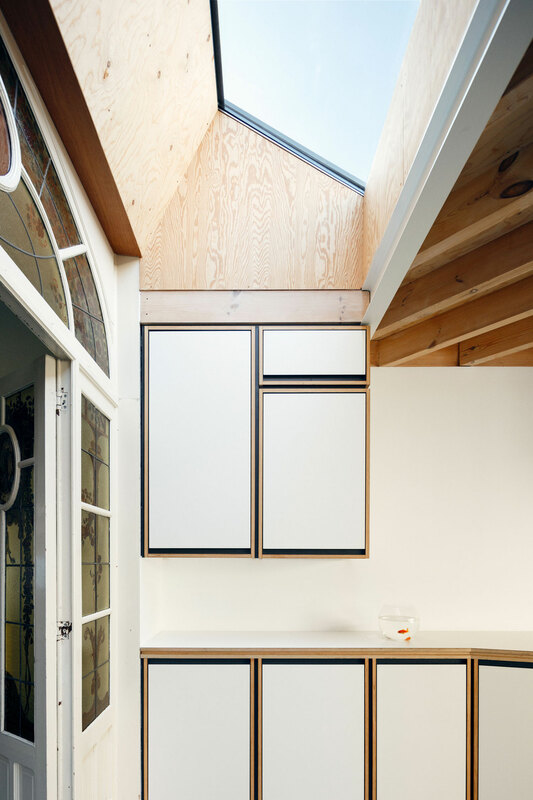 The kitchen construction was optimised by using inexpensive materials such as laminate with exposed plywood edges for joinery. Walls have been painted white, external brick has been left untouched and the ceiling structure has been exposed. Three wooden columns to the back of the new construction are very nicely detailed into the pivot doors. 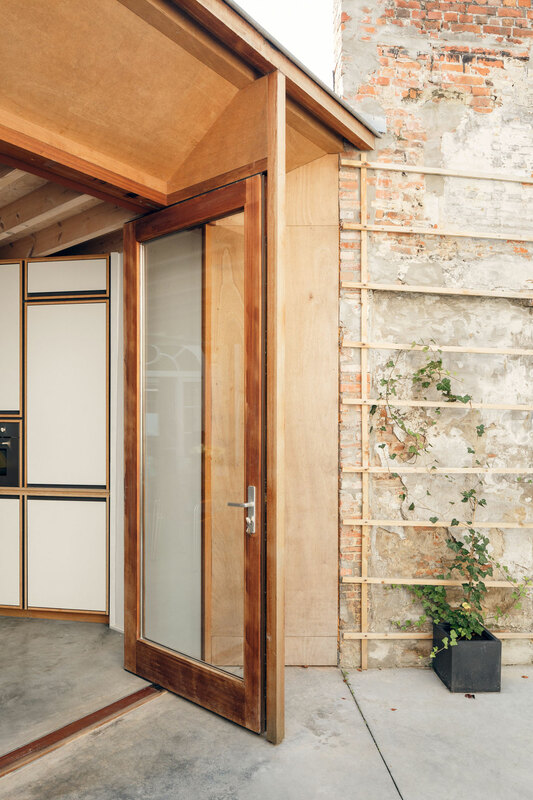 When fully opened, the doors fit neatly into the wooden columns becoming a lovely extension of form. 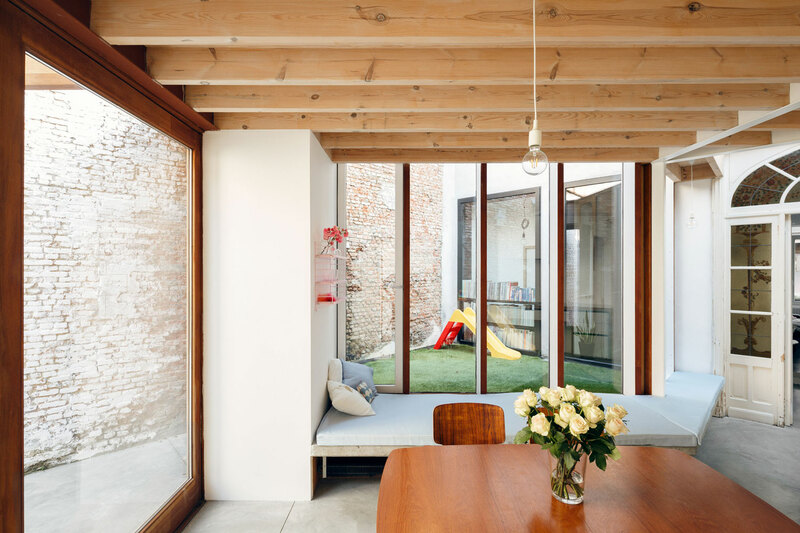 This seemingly simple renovation and extension is much more than meets the eye. There is captivating light quality, innate functionality and a sense of homeliness that i.s.m.architecten have lovingly created. 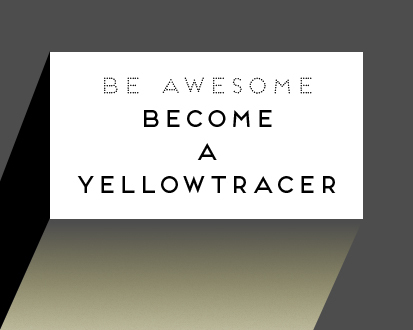 A delightfully refreshing project! Wonjun Jeong Captures Floating Ethereal Images in The Sky. That exquisite workmanship, design and detail in the glorious stained glass – offset by plywood?? From the sublime to the ridiculous.